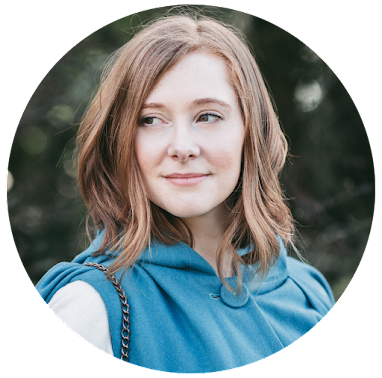 In my head, when I pictured turning 30, I wanted it to be a spectacularly grand affair. An avid fan of The Tudors (Anne Boleyn in particular) I envisaged a Tudor feast, with lots of food, costumes, and of course, period dancing! Fast forward to late 2016, and, finding myself somewhat incapable of throwing my usual shapes, the plan had to change. As a teen, I really got into my super-sleuths (thanks MG), and one year, upon stumbling across the Murder a a Carte games series, decided that this was going to be a birthday tradition that would never cease to entertain. Now, as the big 3-0 approached, and finding myself at a bit of a loss, suddenly the now re-branded murder mystery game sprung to mind. Hosting one of these nights can be both incredibly entertaining (read Sarah's post about the night as testimony) and incredibly stressful in equal measure. Throw having an early January birthday into the mix and it could be a recipe for disaster. The key factor in making one of these nights fantastic is planning. There is no time to early to start the preparations, especially if you wish to incorporate fancy dress and have guests who need to travel to attend. I started in the latter months of last year to ensure that everyone had ample time to prepare for the festivities. A strategy that ultimately, worked absolutely in our favour. It really helped as well that Ryan flung himself into the party prep. Taking instant charge of the menu, in the weeks (and even days) leading up to the party it was pretty much all we talked about. From the dinner courses through to the cocktail menu, he was there with me, insisting on helping host and spending hours thinking about how to set up our living and dining space so that it was in keeping with the setting (all games are set at some-point in recent history). Having both of us there on the night guiding the proceedings kept things smooth and on track. It is very easy to get side-tracked during these evenings, but with just one quick look to him for help, we were able to steer things back on course. 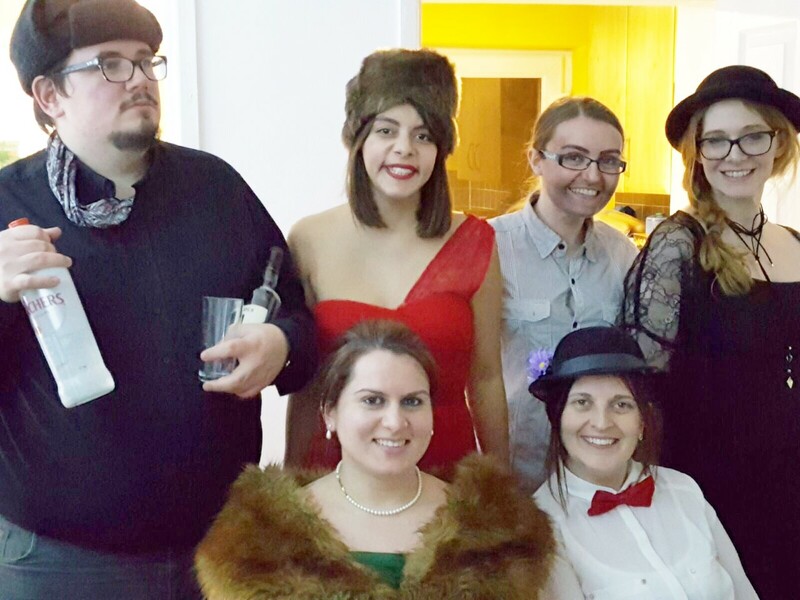 Having everybody attend in fancy dress really helped set the atmosphere - along with a carefully put together Spotify playlist. The incentive of prizes really helped too, with these being awarded to those who guessed the murderer/s at the end, and a "Best Dressed" category too. Having guests who are entirely willing to put on accents, get into character, and not break from their role really adds to the enjoyment, and at some points during the evening we all found ourselves howling at each other across the table (how I didn't wet myself is beyond me)! Even with a cooker that had been condemned hours earlier, the food went down a treat. 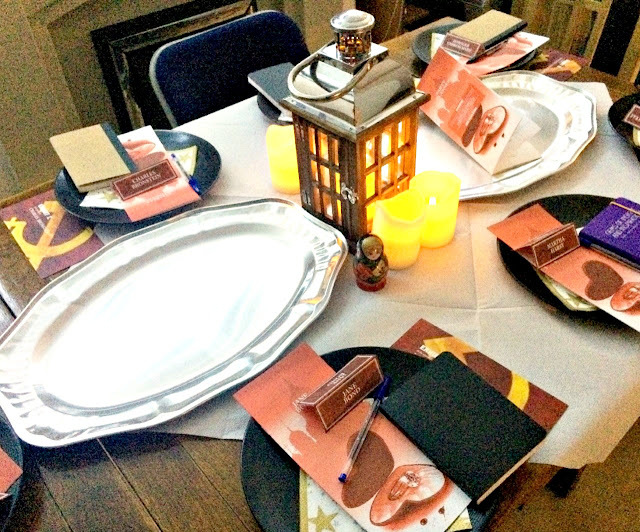 The games themselves come with a party planner booklet, which guides you through how to host, with both music and menu recommendations that tie-in with the evening's theme. We opted for a food extravaganza, with a champagne reception, cocktails and caviar canapé, and a three course meal as the game took place. But the pièce de résistance had to be my birthday cake. I knew I wanted to treat myself to something spectacular for the evening, so called on Cakes by Andrew to help me out with something breath-taking that could take centre stage. And oh boy did it just do that! 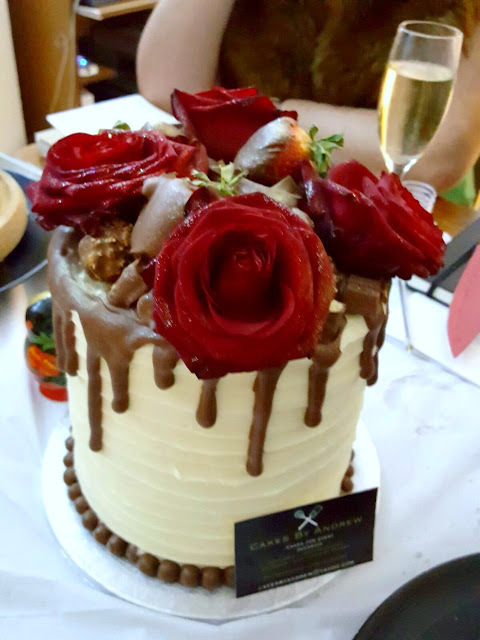 The beautiful cake consisted of layer upon layer of delicate sponge and filling, topped with assorted chocolate, chocolate-dipped strawberries and fresh red roses. Everybody couldn't resist snapping a few photos before it was cut and handed out. Befitting a 1920s dinner party, and fulfilling all my birthday cake wishes, it was just an incredible way to finish the evening, and just thinking about how delicious it was now is making my mouth water with glee. The evening was an all-out success from start to finish, and I am so grateful to Ryan for helping me. He spent hours in the kitchen as chef, played bartender and co-host, and really alleviated the pressure. 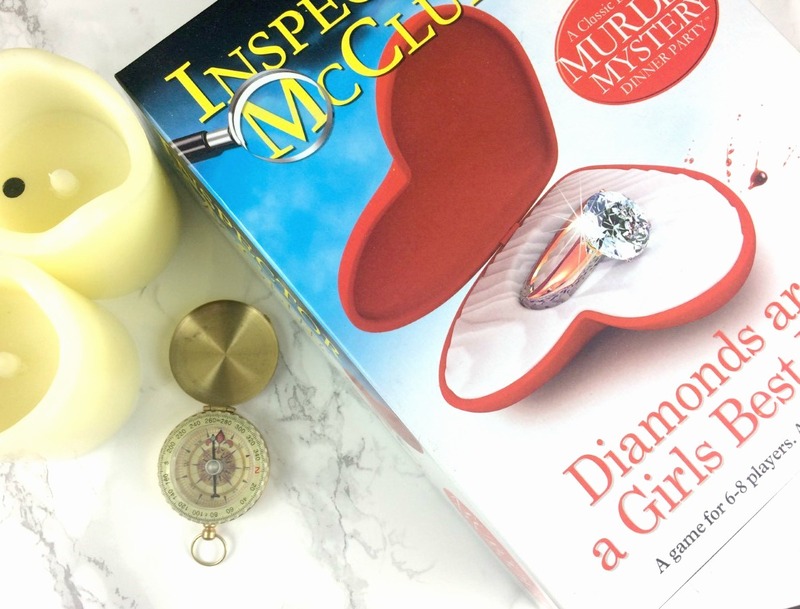 With a number of titles and themes to choose from, I cannot recommend the Inspector McClue murder mystery games enough. For those who love crime dramas, this is the ultimate opportunity to release your inner Poirot. For those who love to play host, it is the perfect way to gather your friends and spend the evening entertaining. And for those who can't/don't want to spend the night stumbling over cobbles through town and elbowing your way to the bar, they provide a much more intimate alternative. If you have ever hosted your own murder mystery dinner party, let me know in the comments - I'd love to hear all about it!